Katoh Gakuen Gyoshu Junior and Senior High School Bilingual Course has integrated the International Baccalaureate Middle Years Program (MYP) and Diploma Program (DP). The pathway that IB students take means a process where young students become lifelong learners in their high school and throughout their life by developing the attributes of the IB learner profile under IB mission statement. As a pathway after graduating from high school, most students choose universities/colleges to continue their high-level education as well as to search for a path to their future career. What is the educational content students wish to continue at university? It can be found in the International Baccalaureate mission statement. The distinctive features of IB education are, as expressed in IB mission Statement, a high-quality and challenging education, holistic learning, and intercultural awareness and communication. These features become a core to guide IB students to a future career. If you look at 6 years of Gyoshu education (Grade 7-12), everyone without exception goes through several turning points in terms of career related standpoints. At the end of each grade and at the transitional point from MYP to DP, some students achieve impressive transformation by struggling. It is as if a caterpillar changes to a beautiful butterfly. There are also some students who pass through these turning points easily without any struggle. In senior high school, students’ attention is moving toward developing a better chemistry between themselves and universities by passing each milestone. There are 7 major turning points from the start of Gyoshu JH Bilingual Course to the start of university life. The features and skills expected from students at each point are described as follows. According to an educational information website managed by Benesse Corporation (Japanese company focusing correspondence education and publishing), (Nov 22, 2011), there is the term “Grade 7 Gap.” According to the site, “Grade 7 Gap” represents the difficulty of transition from elementary school to junior high school. The difficulties are caused by several gaps between two educational systems such as the subject-based teacher assignment system, term-exams, clear grading system, the change of commuting methods, the strict relationship between seniors and juniors in club activities, longer school hours, hormone imbalance of a growth period, and the complicated friendships with the use of SNS. It is true that elementary school students all over Japan experience this “Grade 7 Gap” and learn to become junior high school students. Now, how about our students at Gyoshu High School? In addition to this “Grade 7 Gap”, they make their MYP debut as well. MYP debut means entering the unknown IB world. At Gyoshu High School, the MYP is implemented for 4 years (Grade 7-10), and students work hard so that they are prepared for DP which starts at SH2 (Grade 11). Since its inauguration in 1968, the IB has revised and developed its programs. In recent years, continuity and alignment between MYP and DP are more emphasized. Compared to 1968 which is the start of MYP, as well as in 1998 when Gyoshu High School introduced the MYP for the first time, the enrichment and smooth continuity of the MYP and DP are remarkably increasing. In this sense, the MYP debut also means that they start their journey of 6 years toward obtaining a DP full-Diploma. This is, for newly enrolled junior high school students, a big step and it is bigger than “Grade 7 Gap” indeed. The Bilingual Course students start their school life after attending an entrance ceremony and MYP orientation followed by various orientations regarding each MYP subject, Service as Action (SA), and the use of an online student account. They also engage in science lab reports, English essay writing, and geography projects from their first term. Bilingual Course JH1 (Grade 7) students go through the gate of IB as well as pass a milestone for general junior high school students. It is like people who have been enjoying throwing balls until yesterday start to practice by aiming for the Major League. Self-management skills including the organization of time and belongings along with ATL (Approaches to Learning) skills. Basic subject skills. These skills are assessed through each subject and explicitly shown in the report card. Therefore, students are able to see own achievement level in each area. Particularly in English, the steady development of basic writing skills including grammar, reading comprehension and vocabulary is required. As English proficiency, students are expected to pass Level 2 or higher in the Eiken STEP test. Students also cultivate caring minds and patience as well as communication with others through SA experiences and keep records of what they have learned. At Gyoshu High School, the DP is implemented in 2 years of SH 2-3 (Grade 11-12). All Bilingual Course students take the DP. The course selection at the time of JH 3 (Grade 9) is conducted by considering whether they continue to SH Bilingual Course for DP or they want to choose regular courses by aiming for general entrance examinations of domestic universities. At the time of JH3, which is also the 3rd year of their MYP study, students become more emotionally stable and start to think about university options. During the course of DP, their engagement in SA (Service as Action) during MYP will become more substantial as CAS and students are more actively involved in activities inside and outside school. The course selection at the time of elementary school and junior high school tends to reflect parents’ intention. However, the selection of senior high school courses is more dependent on the students themselves. There are some students who excel in academic fields, but still not suited to DP. On the other hand, students suited to DP are expected to have characteristics that would make up for their academic disadvantages if any. For example, some students have the emotional stability to endure stress. Some students have the ability to listen to others while developing unique ideas, or have patience and toughness. They understand and appreciate the importance of an IB education, demonstrate a positive attitude and motivation to work in the DP as well as to learn independently. Without any of these, continuing DP study will be difficult. Every kind of feedback such as assessment based on MYP assessment criteria can be used for moving to the next step. 4 English skills must be developed by setting a numerical target. It is important to reflect on SA activities, and develop strategies to expand their own world. Eiken STEP Level 2 or higher is expected by the end of junior high school. In applying to overseas universities, the student’s grade record from JH 3 (Grade 9) to SH 3 (Grade 12) will be submitted to universities. Within MYP 1-7 scales, if students have achieved 5-7 in each subject, they are highly expected to attain DP in the future. SH1 (Grade 10) is the final year of MYP as well as the starting year of DP preparation. Students select DP subjects for the following year. In this sense, SH1 has two-fold importance. Specifically speaking, on the one hand students’ experiences in MYP culminate with the personal project. On the other hand, through the process of DP subject selection, students start to picture the general outline of their future courses. In past, when the continuity between MYP and DP was not as explicit as now, the start of DP was filled with a sense of tension for both students and teachers. From the perspective of future careers, the most important thing in SH1 is the DP subject selection. Students who are considering courses in scientific fields will choose higher levels in science subjects. Students who wish to study liberal arts can choose higher levels in humanities subjects. If students are interested in the field of arts or design, they should choose Arts because the submission of art portfolio is required at the time of university application. In any cases, students will choose their subjects from 6 subject groups with balance. Even if there are students who excel in/are not good at all subject groups and wish to take higher/standard levels in all subjects, it is not possible to arrange due to DP regulations as well as timetable limitations. However, as needed, some kind of compromise can be reached. If students cannot decide higher level subjects, it is advised to choose higher level in science subjects so that it can provide flexibility in the process of future course selection. Every year, many students find difficulty in deciding which level Math and English classes they should take. This judgment is not easy because it is related to which department/major as well as which country they are wishing to go. Furthermore, the choice can also exert an influence on the final grade. Students have to select their subjects with care, by considering their own future career as well as IB requirements and subject score requirements at the point of university admission. It is important, particularly for students who wish to study engineering, business, or architecture, to choose subjects by understanding the differences between the systems of countries as well as the educational content of each university, and the complex subject requirements in detail. Furthermore, once students select DP subjects and register to the IB, it is not able to change the subject in principle. At SH1 (Grade 10), students are expected to take TOEFL at least once, and to achieve 70 or higher. Students who want to go to universities in the UK are expected to achieve 5-5.5 or higher in IELTS. Students who are thinking to apply for universities in the USA need to prepare for SAT as well. At Gyoshu High School, usually everyone take the PSAT in autumn. From the result of PSAT, the predicted SAT score can be calculated. Students will be prepared for CAS through their active involvement in SA. From summer to autumn, various opportunities such as the talk of graduates about their university life and experience, overseas university guidance, college fairs (domestic and overseas), open campus (domestic), and scholarship events organized by overseas universities as well as educational organizations are available. Orientation sessions regarding DP and each subject are held in April of SH2 (Grade 11). Since the start of the academic year, students run through their first term with some tension. SH3 (Grade 12) is packed with activities such as DP internal assessments, external assessments, and university admissions. Students often lament the lack of time. Therefore, it is strongly recommended for students to engage in CAS activities as much as possible during SH2. Furthermore, the autumn of SH2 is a crucial phase in DP. At this time, the sense of tension is eased and students feel tired. Without being impatient, you can encourage each other and overcome this difficult period. Students who achieve a productive result in the end are people who could overcome this period and improve their learning by encouraging each other with the help of a study group. In SH2 (Grade 11), students are expected to obtain a score of 80 or higher in TOEFL iBT. (Vocabulary, grammar, and writing composition can be a main contributor to achieving this target.) 6 or higher is expected on IELTS. In order to attain good SAT results, specialized preparation is required. In the reading section of SAT, vocabulary will be a key element. To apply for competitive universities in the USA, SAT subject exams may be required. You have to read university admission information in detail. As well as individual college consultation available at school, students are encouraged to contact graduates who are studying at the university they are interested in, as well as to participate in college fairs and overseas events. Grades at the end of each term are the latest estimates for the final IB scores. Students have to work on EE and TOK as well. It is advised to take advantage of advisors effectively, and to keep interim deadlines. Particularly in EE, the first topic selection decides everything. During SH 3 (Grade 12), every other month is filled with different atmosphere and times pass at different speeds. In April-May, students can earn CAS points by being involved in the organization of Sports/Culture festivals. In June-July, there is the term-end exam. It also plays a role as DP exam preparation. Along with the internal assessment so far, DP predicted scores are calculated by summer holiday. By the middle of July, students decide which domestic universities to apply for “IB admissions” and AO admissions. 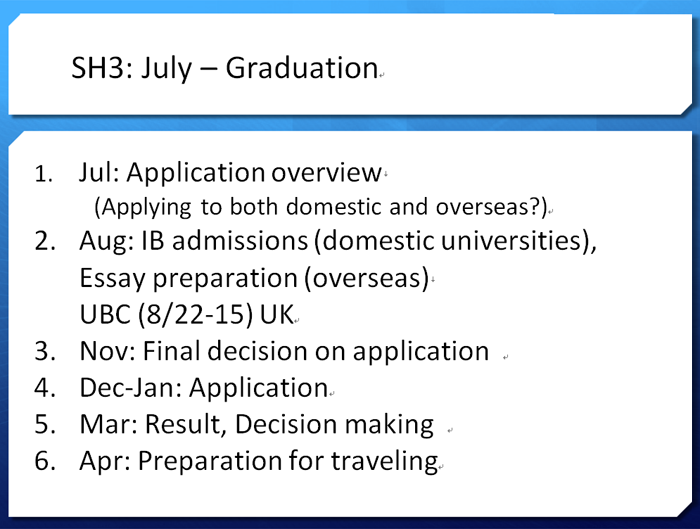 In August-September, students prepare for the application of “IB admissions.” On the other hand, students considering overseas universities take interviews in preparation for the application in autumn. In interviews, which universities he/she is wishing to apply for and the timing of application are discussed based on the student’s expected IB scores, TOEFL scores and SAT scores. From the result of Term 1 term-end exam, the areas need to be reinforced for DP exams in November will be discovered before summer holiday. At the same time, the deadline for the final drafts of EE and TOK will this time. In September-October, there are the Chinese oral exam, the TOK presentation, and the Art exhibition. During this period, some students apply for UCAS or the USA early admissions. Other may apply for IB or AO admissions of domestic universities. There might be some students who take the second-stage exam. From the beginning of November, students take DP examinations which last for 2 weeks. From the second half of November (after the DP examinations) to the end of Term 2, students apply for admission to universities in the USA/Canada/UK. Usually, January 6 is the DP result announcement day. After that, some students apply for scholarships available for overseas students in the USA universities. At the time of SH3 (Grade 12), students are aiming to achieve 90 or higher in TOEFL iBT. (For Gyoshu students, reading and writing are key components.) TOEFL often deals with the content of general subjects. Therefore, daily DP classes are very important in terms of TOEFL preparation. Students will decide whether they take further SAT or not. By summer, students reflect and summarize the content of SA, CAS, EE, and TOK, and work on personal essay. Moreover, students will engage in the preparation of requesting references. In most cases, the admission result will be announced around the time of graduation. The result must be reported to the school at each time. It is important to always check the dashboard of your account in the university’s admissions site. In some cases, it displays information regarding missing documents or application package although you have sent all required documents. In such cases, you have to contact the university to check. If the result is conditional acceptance or a waiting list, the detail of conditions must be checked. Students will decide which university to enroll in by May 1. It is not permitted to enroll in more than one university. Please note that if a student confirms their enrollment to multiple universities, the acceptance will be invalid. If you are accepted by more than one university, it is advised to talk with graduates who are currently studying at the university, or to visit the university. In some cases, students find a big gap between the image they have and the actual situation. Talk with the college counselor as well as your parents to make a comprehensive judgment. Once student decides which university to enroll in, they are required to confirm their acceptance and decline admission from other institutions. Now, you have to apply for university housing, meal plans, orientations, and pre-orientation programs etc. Please note that in some universities course registration is required before your departure. It is time to plan your travel. You have to pack your luggage, confirm the method of paying tuition/housing fees as well as living expenses, and open a bank account. The following table shows the relationship between the final IB scores and university admission (Based on The International Baccalaureate: Guide to University Recognition in Japan, 2012, P10). The maximum IB score is 45. When students take DP examinations in November, the results are announced in the beginning of January. * IB scores are considered as a part of comprehensive admissions information. ** Note that the relationship with world university rankings may not be rigorous. The section was added by referring to the past record. Credit: Universities around the world recognize that IB students have excelled academically. They grant credit for the IB diploma or for individual IB subject examinations or award scholarships to outstanding students. In the UK and Australia, in principle, it is possible for students who have IBDP to graduate from universities in 3 years. Therefore, an IB diploma can be considered equivalent to 1 year university credits. University selection is not a simple task. You have to make judgments by reflecting on yourself as well as foreseeing your future. Everyone has different backgrounds and circumstances. You have to get to know yourself through CAS experiences, and a network of personal contacts, as well as by looking at own future plan and the current strengths. You can also ask advice from college counselors as well as homeroom teachers and other specialists. 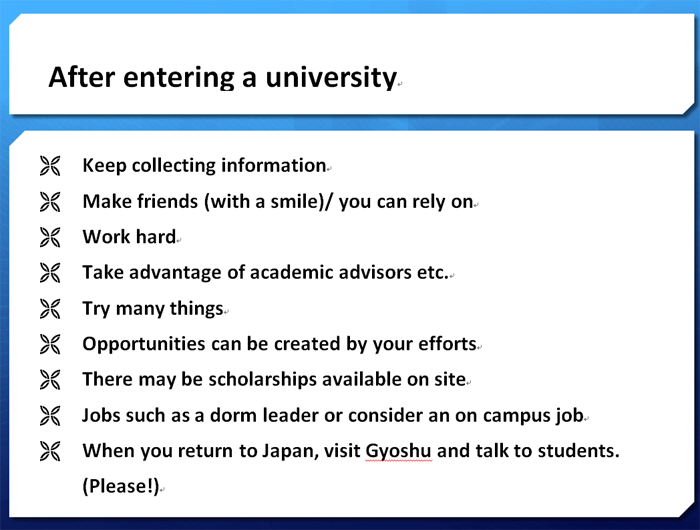 The followings are points to be considered in your university selection. Consider the university as a springboard to exercise your ability flexibly rather than as a place for job training. Don’t be trapped by stereotypes. Your interest may change from time to time and new abilities may be revealed and bloom. Some of the current jobs may no longer exist in future. A new job fields may be created. You have to decide with care by facing yourself. In recent years, university options for IB students are not limited to Inner Circle English speaking countries (the UK, Australia, Canada, and the USA). Universities in non-English countries including Japan have been developing English-medium programs. Furthermore, particularly in Japan, the Japanese Ministry of Education (MEXT) encourages universities to recognize the IB diploma and develop admission processes with the use of DP. The range of choice is expanding for IB students. lease refer to Alumni pages for the required application documents and how they should be prepared in applying for universities in each country. Many people are not concerned about weather. However, living abroad for 3-4 years is quite different from just visiting as a tourist. You need to consider temperature, humidity, dryness, and other features of the local geography. There are also differences in convenience and security depending on where the university is located (the center of a big city, suburb, or rural area). Also the local culture, history, and political background as well as racial composition will differ as well. At a large school, you will be one of many in huge classes. Many large universities provide the combination of large-size lectures and small-size discussion sessions. The student-faculty ratio also needs to be considered. The ethnic origins of students are also impact the college atmosphere. Estimate how much studying at the university will cost for you per year, including tuition and living expense. In case of universities in the UK and Australia, since you may be able to graduate in 3 years, you can multiply the amount by 3 to learn the sum of total cost. In universities in the USA and Canada, you can multiply the amount by 4. However, you may be able to shorten the duration of your study if the university grants credits for your DP scores. The tuition of overseas universities tends to be more expensive. However, there are some areas where the cost of living, including food, dormitory, entertainment, and transportation, is lower than in Japan. You need to include necessary expenses for university life along with tuition. The estimates should be shared with your parents. It might be awkward to talk about money with your parents, but you cannot avoid this topic. Based on that, you may need to apply for merit-base scholarships or student loans, or adjust the choice of universities you apply for. Grade reports are required as part of university application. There are 4 kinds of academic reports; Chosasho (school report required in applying for domestic universities), the certificate of IB predicated score (applying for IB admissions of domestic universities), school transcript (in English), and IB transcript. Choshasho and the certificate of IB predicted scores are required in applying for domestic universities. A school transcript (in English) and IB transcript are required in the admissions process of overseas universities. A transcript is a record of the student’s academic performance. For the Gyoshu Bilingual Course students, 2 types of transcripts are required. One is a “school transcript” issued by school and written in English. It includes the record of grades from JH3 (Grade 9) to SH3 (Grade 12). It also contains IB predicted grades before the announcement of IB final result, and IB final grades after the result announcement. There is also a transcript issued by the IB. This is sent directly to an institute of higher education by the IB on a request basis. Universities apart from the USA put higher emphasis on IB scores than high school transcripts. In the USA, universities place trust on our grades as an IB school. However, since many high schools all over the USA adjust grades, universities occasionally outsource a service provider to recalculate the high school transcript. Therefore, in recent years, high schools in the USA also try to issue standardized transcripts. Post-secondary institutes for which students are applying for entrance often require official IB transcripts to be sent directly to them from the IB. should be sent to UCAS. A maximum of 3 transcripts can be requested for Canadian and American (USA) colleges. Only 1 transcript for American (USA) colleges can be requested. Submit transcript request form to the DP coordinator. To order transcripts go http://www.ibo.org/and follow the instructions. There is a cost for this service. Canada, USA, and Singapore Jan 1 To order transcripts go http://www.ibo.org/and follow the instructions. There is a cost for this service. (School Recommendation) September Chosasho (GPA) Students the school can recommend in terms of GPA and English abilities etc. IB predicated grades Conditional acceptance offered by considering subject and score requirements. IB final score needs to be submitted. IB Transcript Subject and score requirements. Send an official transcript to the university. IB transcript will be sent by the IB.